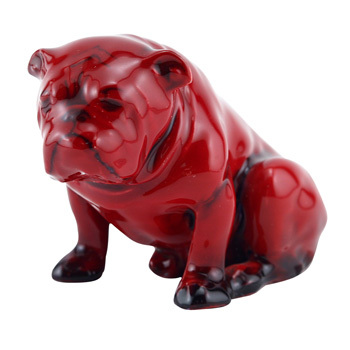 Inspired by a recent post to our facebook page, here is a little something on Doulton’s perennially popular Bulldogs! 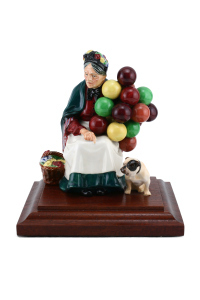 Doulton’s most famous figure, The Old Balloon Seller with her Bulldog ca. 1938.
bred into a much tamer breed. The bulldog’s association with all things British and of course lately the world of James Bond, stems from the two world wars of the twentieth century. 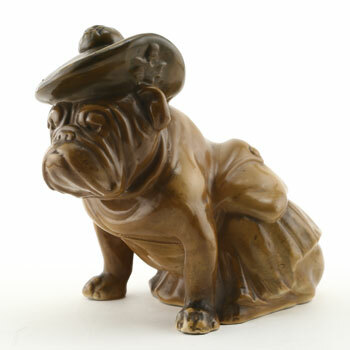 In 1917, Royal Doulton produced a large khaki Bulldog, seated with either a tin hat or a tam o’shanter (cap) representing the uniforms of English and Scottish soldiers during the First World War. Bulldog in khaki with tam o’shanter. 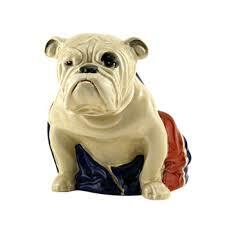 In 1941, Royal Doulton went on to produce a series of seated Bulldogs with union jacks draped on their backs, representing and helping to promote the national feeling during this difficult period in history. national hero, wearing different headgear and smoking his familiar cigar! Above and below, two more Winston Churchill inspired bulldogs. Versions of bulldogs draped in union jack flags were actually produced earlier as advertising flasks for alcohol retailers. 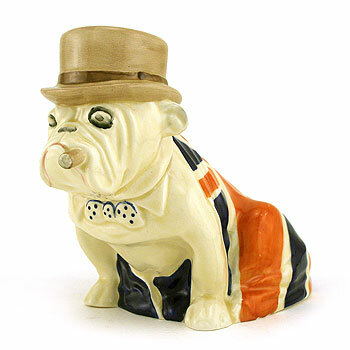 There are other very rare variations of Doulton bulldogs to be found including one with an eye patch and another in a Khaki glaze with the familiar union jack on its back. 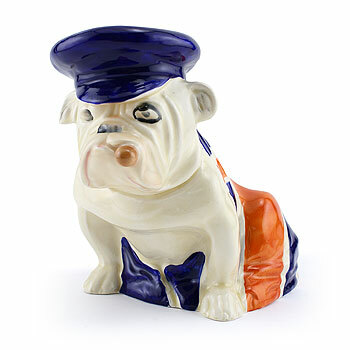 Some of the rarest bulldogs to find include bulldog flasks, a very unusual wall pocket and also bulldogs mounted on pottery boxes. It is thus not surprising to see that this famous Doulton hero has been adopted as the spirit of British survival and given a starring role in the latest James Bond film, Skyfall, where he survives an assassination attempt on ‘M’ in London, England. And finally, a wonderful flambé bulldog. As always many thanks to Seaway China for the use of their photo library. CE.